Chef Franco Lombardo was born in Palermo, Italy and came to the United States in 1995. After working at the famous trattoria La Locanda del Ghiottone in Philadelphia, Franco moved to Collingswood, New Jersey to raise his family. 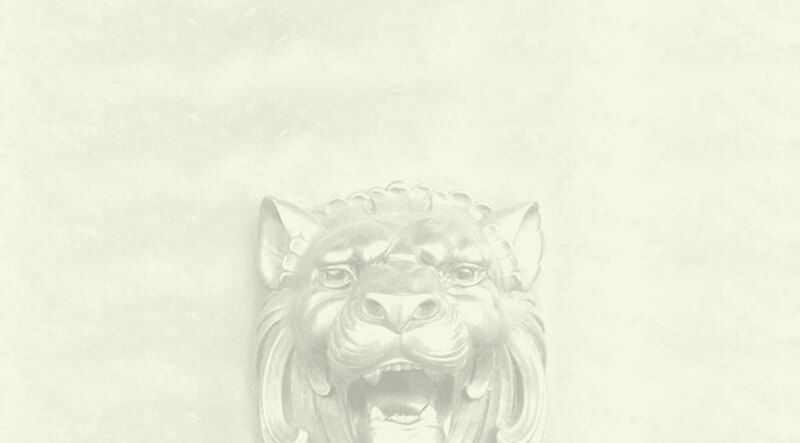 In November 2003, Sapori opened its doors. Meaning “flavors” in Italian, Sapori delivers just that. 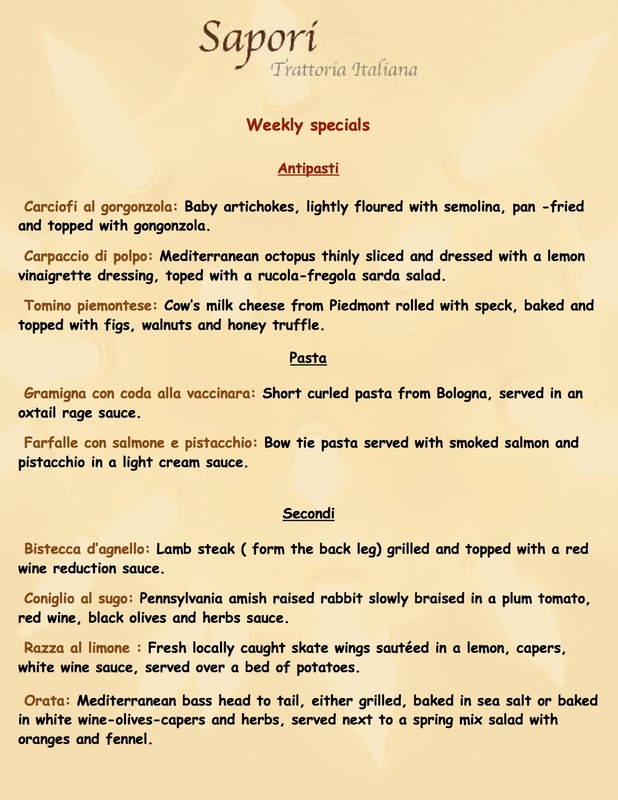 Franco himself creates authentic dishes whose recipes range from North to the South of Italy based on seasonal ingredient availability. Since opening, Sapori has been known to deliver the most authentic Italian cuisine and keeps customers coming back for more. Franco’s motto is “I cook as if I never left my country, assuming that everyone of my customers is an Italian native like me and is knowledgable about good food.” Buon Appetito! Spring mix salad served with olives, tomato and mozzarella tossed in our house dressing. A selection of few Italian regional specialties: eggplant caponata, prosciutto, cheeses, olives, mushrooms, artichoke, roasted pepper and more. Baby rucola salad with dried figs, pears, walnuts and gorgonzola cheese in an extra virgin olive oil-balsamic vinegar dressing. Rucola, tuna cured in olive oil, red onion, green olives, capers, sun-dried tomatoes and pine nuts and dressed with a red wine vinaigrette. Filet Mignon sliced wafer thin cured in an olive oil and lemon emulsion under a baby rucola salad with shavings of Parmiggiano Reggiano. Baby rucola tossed with goat cheese, spek, red beets and pine nuts in a strawberry vinaigrette. Lightly floured calamari fried and served with a light pesto and tomato sauce. Mussels steamed open in a tomato broth with garlic, oregano, parsley and an ample amount of white wine. They don’t get any better than this! Stripes of chicken thigh sautéed with mushrooms, pancetta and sun-dried tomatoes in a red wine-touch of tomato sauce. Homemade potato gnocchi served in a tomato basil sauce. Homemade cheese tortellini served in mushroom sauce with prosciutto, peas and a touch of cream. Italian ground sausage sautéed with eggplant and mushrooms, in a red wine roasted tomatoes sauce. Smoked pancetta sautéed with onion and plum tomatoes, tossed with pennette pasta. Diced shrimp sautéed with zucchini, pine nuts and cherry tomatoes in a white wine-zucchini saffron sauce, tossed with casarecce pasta. Mussels, shrimp, clams and calamari sautéed in a white wine garlic sauce and a touch of tomato, served with linguine. Diced snapper sautéed in a plum tomatoes-mint-basil sauce, tossed with casarecce pasta. All natural boneless chicken thigh grilled, served with a baby rucola, fresh tomatoes, shavings of parmiggiano salad, dressed with a honey-mustard vinaigrette. All natural boneless chicken thigh sautéed with mushrooms and peppers and served next to rosemary roasted potatoes. All natural boneless chicken thigh pan-seared and topped with eggplant and smoked mozzarella, served in a light tomato-red wine sauce, served next to sautéed spinach. Filet veal topped with prosciutto and fontina cheese, served in a red wine mushroom demiglaze sauce, served next to red beets. Filets of veal sautéed with shallots in a butter-sage-lemon sauce, served next to spinach. Lightly breaded veal cutlet pan–fried and topped with rucola and fresh chopped tomatoes, dressed with a honey mustard vinaigrette, served with potatoes. Pork, parsley and sweet provolone cheese sausage, grilled and served over a bed of sautéed lentils over chick pea polenta, topped with goat cheese. Monkfish cooked with eggplant, capers, olives, potatoes and bell peppers in a plum tomato sauce. Filet of Bass, sautéed with mussels, shrimp and calamari in a white wine-tomato-seafood broth-garlic sauce. Grilled shrimp tossed with spring mix, toasted almond, cherry tomatoes and roasted peppers dressed with a olive oil-lemon vinaigrette. A select few antipasti from various regions in Italy. Filet Mignon sliced wafer thin cured in an olive oil and lemon emulsion under a baby rucola salad with shavings of Parmigiano Reggiano. Baby rucola and red beets tossed with smoked prosciutto, toasted pine nuts, goat cheese and roasted peppers, in a fig balsamic dressing. Rucola salad with dried figs, walnuts, pears and gorgonzola cheese in an extra virgin olive oil-balsamic vinegar dressing. Imported from Naples buffalo milk mozzarella served with bresaola (cured beef), baby rucola, tomato and olives. Lightly semolina floured calamari deep fried. Mussels steamed open in a tomato broth with garlic, oregano, parsley and an ample amount of white wine. Pork, fennel seed, broccoli rabe and sweet provolone sausage, grilled and served over a chick pea polenta and sautéed lentils, topped with goat cheese. Portobello mushroom topped with goat cheese, black truffle and toasted almonds, baked and drizzled with balsamic. Baby rucola tossed with prosciutto, artichokes, shavings of parmigiano cheese, olives and capers in a leek-garlic-olive oil dressing. Italian imported porcini sautéed in a white wine onion-touch of cream sauce, served with homemade fettuccine. Italian ground sausage sautéed with diced eggplant and mushrooms, served with pennette pasta. Pennette pasta tossed with smoked pancetta, onion and eggplant in a plum tomato sauce. Casarecce pasta tossed with ground sausage, butternut squash and smoked mozzarella in a white wine-touch of cream sauce. Cheese tortellini served in a mushroom sauce with prosciutto, shallots, green peas and a touch of cream. Homemade potato gnocchi served in a veal-pork-beef-tomato ragu’ sauce. Diced Maine Shrimp sautéed with zucchini, grape tomatoes, shallot and garlic in a white wine-saffron sauce, tossed with casarecce pasta. Mussels, shrimp, clams and calamari sautéed in a white wine-roasted tomato garlic sauce served with risotto arborio. Maine lobster meat sautéed with shallot and cherry tomatoes in a white wine-tomato-touch of cream sauce, served with homemade fettuccine over a layer of pesto. Filets of veal sautéed with mushrooms, figs and shallots, topped with goat cheese and served in a veal demiglaze sauce. All natural flat iron steak lightly breaded, flash seared and topped with rucola, shavings of parmigiano and bruschetta tomatoes, served next to mascarpone flavored mashed potatoes. All natural boneless chicken thigh topped with prosciutto and fontina cheese sautéed with shallots and mushrooms and served next to rosemary roasted potatoes. Salmon dusted with fresh herbs and pistachio, baked, topped with fried leeks, drizzled with a balsamic-wasabi dressing served next to spinach and baked squash. All natural chicken thigh sautéed with shitakee mushrooms, black olives, sun-dried tomatoes and artichokes. Pork medallions pan-seared and topped with a yellow apple-scallion-pancetta-demiglaze touch of honey sauce, served next to mascarpone flavored mashed potatoes and red beets. Red snapper filet sautéed with clams, mussels and calamari in a white wine-saffron seafood stock sauce, served over crostini. Unique and authentic dishes from different regions of Italy. eggplant caponata, panelle, mushrooms, roasted peppers and more. sausage and smoked mozzarella, with a touch of cream. All natural boneless chicken thigh sautéed in a red wine demi-glace with mushrooms, onion and bell peppers, served next to roasted potatoes. Pork medallions pan-seared and topped with a yellow a demi-glace made with apples, scallions, pancetta and a touch of honey, served next to mascarpone mashed potatoes and red beets. Filet of mediterranean branzino sautéed in a shite wine-plum tomato- saffron sauce along with calamari and mussels with black olives. A great way to treat yourself, a friend or co-worker. 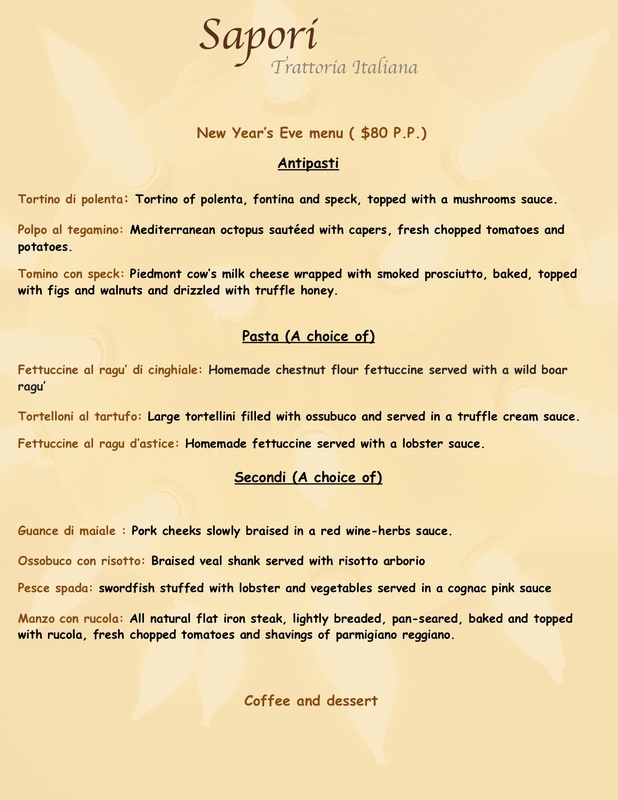 The gift of truly authentic italian cusine. 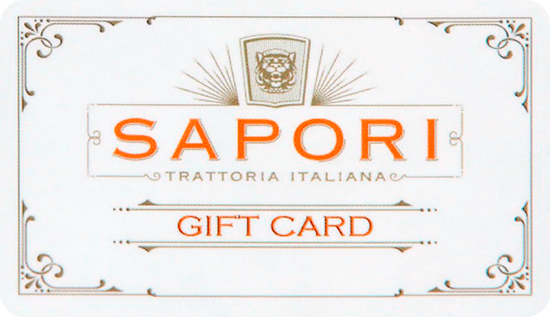 Order a Sapori gift card today.